In the early stages of the war, revivals like the one Marks led were not the rule but the exception. Religion did not seem to have left home with the soldiers. The situation changed, however, as the war became more serious and prolonged. After the decisive campaigns at Gettysburg, Vicksburg, and Chattanooga in 1863, revivals became a regular feature of Union army life. By that time, tested northern veterans saw the gravity of the military task confronting them. Many sought support in religion. In the Army of the Potomac, a great religious excitement appeared during the winter of 1863–64. Numerous brigades erected churches and chapel tents for prayer meetings. General McAllister said he had never witnessed a better religious feeling among the men. And a reporter for a religious magazine thought the piety of the Union army would win the whole nation to Christ! Revivals in the Confederate armies may have been even more intense than among the northern troops. Like their northern counterparts, southerners became noticeably more religious as the war progressed. Beginning in the fall of 1863, an event later called the “Great Revival” was in full progress throughout the Army of Northern Virginia. Before the revival was interrupted by Grant’s attack in May 1864, approximately seven thousand soldiers—10 percent of Lee’s force—were reportedly converted. Even Confederate commanders came forward in this period to accept the Christian faith. General John Bell Hood, crippled by multiple battlefield wounds, was baptized in the fall of 1864. Henry Lay, Episcopal bishop of Arkansas, described the scene: Hood, “unable to kneel . . . supported himself on his crutch and staff, and with bowed head received the benediction.” With precious little left, southern soldiers sought spiritual strength from their religious experience. Finally, when all the guns fell silent, and the defeated Confederates were dispersed, the northern soldiers who had defended the Union gathered for a last, grand encampment in Washington. Chaplains, agents of the Christian Commission, and ordinary Christian soldiers recognized this as a providential opportunity to minister to an immense gathering of men. They zealously plunged into the task of saving souls. How many soldiers were converted during the Civil War? The best estimates of conversions in the Union forces place the figure between 100,000 and 200,000 men—about 5–10 percent of all individuals engaged in the conflict. In the smaller Confederate armies, at least 100,000 were converted. Since these numbers include only conversions and do not represent the number of soldiers actually swept up in the revivals—a yet more substantial figure-the impact of revivals during the Civil War surely was tremendous. The soldiers involved in the revivals felt a personal and intensely spiritual experience. Yet the revivals had a social dimension. They encouraged soldiers to abandon such behaviors as card playing or swearing and to adopt the habits of strict Sabbath observance, prayer, and Bible reading. The army revivals probably made a more lasting effect on Christianity in the South than in the North. At the close of the war, the North’s religious aspirations for America rose to a peak. The very success the Union enjoyed encouraged northerners to new labors: converting immigrants entering their cities, alleviating oppressive social conditions through a Social Gospel, and bringing the gospel to “benighted heathen” overseas. At this time, however, traditional doctrines seemed to be under attack. Liberal theologians were thought to be cutting away at Christian orthodoxy and rejecting the idea of a changeless faith. Amid the materialism and secularism of the Gilded Age, many ordinary Christians in the North fitfully sought reassurance that their beliefs were still true. In the South, on the other hand, little seemed to be left except religion. For many years after Appomattox, southern Christians spoke of the spiritual benefits they had gained through adversity. Temporal prosperity made men and women arrogant and seduced them into believing they did not need God. The South’s hardship, on the other hand, taught forbearance and Christian humility. A passage in William Faulkner’s novel The Unvanquished poignantly captures the mood of southern churches following the war. Faulkner describes Brother Fortinbride, a lay preacher and former soldier. “Victory without God is mockery and delusion,” Faulkner’s character says, “but . . . defeat with God is not defeat” at all. Religious victory in the midst of temporal defeat was the South’s hope in a depressing time. By Gardiner H. Shattuck, Jr.
Dr. Gardiner H. Shattuck, Jr. teaches church history in the School for Ministries of the Episcopal Diocese of Rhode Island. 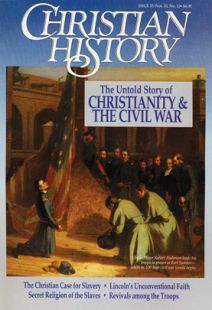 He is author of A Shield and Hiding Place: The Religious Life of the Civil War Armies (Mercer University Press, 1987). While carrying tracts to Union troops, one preacher was seized by Confederates as a spy. Chronology of the United States Civil War. These Christian generals helped wage the Civil War, and their faith affected how they did it.